Air: Nearest airport is at Tiruchchirappalli 110 km away from Gangaikonda Cholapuram. Rail: Ariyalur railway station is located between Chennai-Tiruchchirappalli broad gauge lines. Road: Ariyalur is connected by road with Tiruchchirappalli, Chidambaram, Gangaikonda Cholapuram (45 km), Thanjavur, Salem and other nearby places. Melappaluvur: On the road to Tiruchchirappalli from Ariyalur is Melappaluvur, which sanctified by the hymns of Tamil Saint. The rock cut temple dedicated Lord Vishnu has an enticing appeal to the devotee and the visitor. It has been preserved as a monument. One can reach Melappaluvur by road from Ariyalur to Tiruchchirappalli. Pachamalai (The Green House): TGreen clad mountain rising literally to a height 2000 ft. and dominating the surroundings landscape is Pachamalai. Pachamalai literally mean Green Mountain. A few 3000-foot-high cliffs and vales dotted with green pastures and rustling streams add more charm and verdurous elegance. Elakkurichi: IA large number of Christian and Hindus visit Elakkurichi to worship at Adaikalamadha Church here. Fr. C. N. Beski, a Christian missionary who is called as Veeramamunivar renovated this church. Kallankurichi Temple: It is situated just 5 km on the east of Ariyalur. It is a small village but endowed with Varadaraja Perumal Temple which attracts thousand of devotes from all over the district during April-May. Thirumanur: Thirumanur is a place of Holy Stag situated 20 km away from Ariyalur. It is said that Raja Chola left the 20 ft. high statue here on his way from Perambalur to Thanjavur. The 20 ft. tall compound wall all round the temple, the mighty seven storey Rajagokuram on the eastern entrance, the magnificent Nandhi abutting the Sthala-Viruksham, the two storeyed inner prakaram are all examples of high degree mastery over architecture. The sun’s ray fall on the deity in the garbagraha, on a few days in a year,the gesture of adoration to the deity by the sun god. Sathanur (fossillised tree): Santhanur is situated at a distance of 25 km from Ariyalur. It is the place of interest to tourist, students and researchers. Here one can see the specimens of fossillised tree. The tree measures 18 mts. in length and root formation rings with trunk of the sea can be seen vividly in the rock. The entire area surrounding the fossillised tree is now a protected geological monument. Kamarasavalli: It is located 30 km from Ariyalur railway station. Kamarasavalli has temple built by Raja Chola. 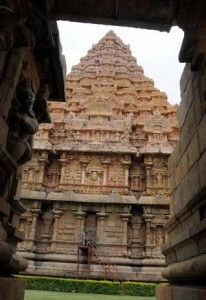 A number of Chola inscriptions are found in this temple. Karaivetai Vettaikudi Birds’ Sanctuary: It is located from 35 km from Thanjavur and 65 km from Tiruchi. Karaivetai Vettaikudi Birds’ Sanctuary sprawls over 454 hc. of area. It is a large irrigation reservoir with water storage capacity of 228.5 mcft. This entry was posted in Ariyalur, Tamil Nadu. Bookmark the permalink.